CINCINNATI – The public was shocked by the offensive behavior of a GOP presidential candidate this week. But for once, it wasn’t the ever-controversial Donald Trump making headlines. This time, Ohio Gov. John Kasich gave us all something to think about when he publicly revealed he doesn’t know how to eat pizza. During a campaign stop in Queens, New York Tuesday, Kasich blasphemed against cheesy goodness everywhere when he cut into a classic New York-style slice with a knife and fork. On Good Morning America, Kasich later claimed the pizza was “scalding hot.” That story doesn’t hold up. 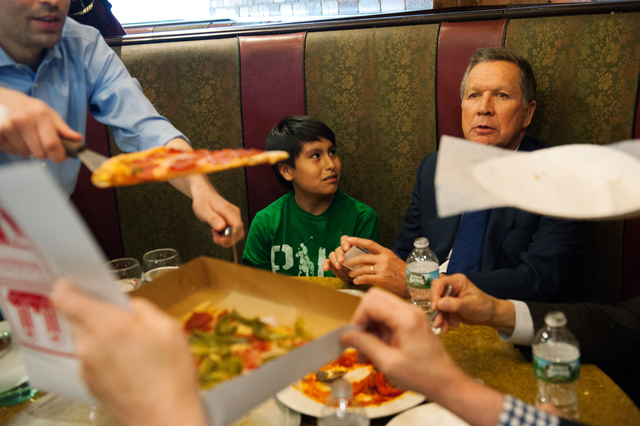 A photographer from Getty Images caught Kasich, who must have realized his enormous faux pas (faux pizz-as?) after the first slice, picking up his next two almost like a real person. Almost. Too little, too late, Johnny. He’s not even folding the slices, just awkwardly holding them up like he’s putting up a new shelf. At the pizzeria, he dug into more than two slices (but didn't finish the third) and a sausage. “A man’s got to eat!” he told ABC News. The pizza crisis could be the start of a bad turn for Kasich who, despite being a solid third in the current GOP contest, has recently polled as the party’s best choice in a race against Democrat frontrunner Hillary Clinton. This could go down in history as the pizza that cost Kasich the presidency. Of course, Kasich isn’t the only pizza goofus in this race. Trump has also been caught on camera eating pizza with a knife and fork. I say to Kasich: There's mushroom for improvement.